In this list of Best Environmental Books, we have captured the ‘must read’ books that cover topics from sustainable business and climate change to environmental economics and philosophy. Whether you are a business owner looking for concrete guidance and blueprints or are an enthusiast eager to learn more, there is a book for every type of reader on this list. 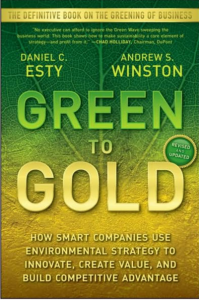 Written by two Yale professors, this book lays out what every executive should know about managing environmental challenges while creating value and building a competitive advantage. This book has sold over 100,000 copies in seven languages and Inc. Magazine recently featured it on its list of 10 Best Business Books for Going Green. If you are looking for a book that provides actionable advice and tangible examples from successful companies (such as Toyota and Ikea) then this should be your first purchase. “While many have focused on what sustainability means for business strategy, precious few have paid attention to actually making it happen inside large corporations. 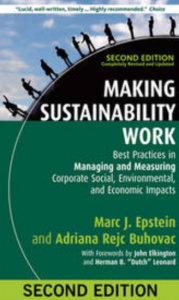 In this new book, Marc Epstein shines the guiding light for those charged with implementing sustainability the necessary structures, systems, metrics, and performance measurements. If your challenge is to overcome the corporate antibodies to drive innovation through sustainability, this is a must-read.” Stuart L. Hart, S.C. Johnson Chair of Sustainable Global Enterprise, Cornell University, and author of Capitalism at the Crossroads –Cornell University. 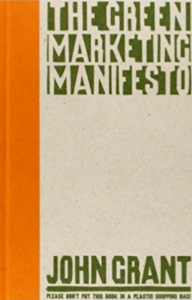 The Green Marketing Manifesto provides a roadmap on how to organize green marketing effectively and sustainably. It offers a fresh start for green marketing, one that provides a practical and ingenious approach. The book offers many examples from companies and brands who are making headway in this difficult arena, such as Marks & Spencer, Sky, Virgin, Toyota, Tesco, O2 to give an indication of the potential of this route. John Grant creates a ‘Green Matrix’ as a tool for examining current practice and the practice that the future needs to embrace. Remarkably, the same individuals surface repeatedly – some of the same figures who have claimed that the science of global warming is “not settled” denied the truth of studies linking smoking to lung cancer, coal smoke to acid rain, and CFCs to the ozone hole. “Doubt is our product,” wrote one tobacco executive. These ‘experts’ supplied it. Reprinted many times since its publication, it remains the only work that looks in detail at the political issues posed by global warming. This new edition has been thoroughly updated and provides a state-of-the-art discussion of the most formidable challenge humanity faces this century. If climate change goes unchecked, the consequences are likely to be catastrophic for human life on earth. Yet for most people and for many policy-makers too, it tends to be a back-of-the-mind issue. We recognize its importance and even its urgency, but for the most part it is swamped by more immediate concerns. The Burning Question reveals climate change to be the most fascinating scientific, political and social puzzle in history. It shows that carbon emissions are still accelerating upwards, following an exponential curve that goes back centuries. One reason is that saving energy is like squeezing a balloon: reductions in one place lead to increases elsewhere. Another reason is that clean energy sources don’t in themselves slow the rate of fossil fuel extraction. Tackling global warming will mean persuading the world to abandon oil, coal and gas reserves worth many trillions of dollars – at least until we have the means to put carbon back in the ground. The burning question is whether that can be done. Mark Lynas’s incredible new book is not science-fiction; nor is it sensationalist. The title, ‘Six Degrees’, refers to the terrifying possibility that average temperatures will rise by up to six degrees within the next hundred years. This is the first time we have had a reliable picture of how the collapse of our civilisation will unfold unless urgent action is taken. Jeremy Leggett gives a personal testimony of the dangers often ignored and incompletely understood – a journey through the human mind, the institutionalization of denial, and the reasons civilizations fail. It is also an account of tantalizing hope, because mobilizing renewables and redeploying energy funding can soften the crash of modern capitalism and set us on a road to renaissance. Addressing the sustainable energy crisis in an objective manner, this enlightening book analyzes the relevant numbers and organizes a plan for change on both a personal level and an international scale–for Europe, the United States, and the world. In case study format, this informative reference answers questions surrounding nuclear energy, the potential of sustainable fossil fuels, and the possibilities of sharing renewable power with foreign countries. When first published, Capitalism as if the World Matters, by one of the leading ‘eco-warriors’ of our time, shocked a generation of both environmentalists and business people. Jonathon Porritt brushed aside their artificial battle lines with a powerful argument that the only way to save the world from environmental catastrophe is to embrace a new type of capitalism, and to do it quickly. In this substantially revised and updated edition, Porritt extends his powerful and controversial argument by providing fresh evidence and suggesting new actions. Economic heresy? Or an opportunity to improve the sources of well-being, creativity and lasting prosperity that lie outside the realm of the market? Tim Jackson provides a credible vision of how human society can flourish within the ecological limits of a finite planet. Fulfilling this vision is simply the most urgent task of our times. Small is Beautiful is E. F. Schumacher’s stimulating and controversial study of economics and its purpose. This remarkable book examines our modern economic system – its use of resources and impact on how we live – questioning whether they reflect what we truly care about. The revolutionary ideas are as pertinent, inspirational and thought-provoking today as when they were first published in 1973. In this classic work that continues to inspire its many readers, Jim Lovelock puts forward his idea that life on earth functions as a single organism. Written for non-scientists, Gaia is a journey through time and space in search of evidence with which to support a new and radically different model of our planet. In contrast to conventional belief that living matter is passive in the face of threats to its existence, the book explores the hypothesis that the earth’s living matter air, ocean, and land surfaces forms a complex system that has the capacity to keep the Earth a fit place for life. In Feral, George Monbiot, one of the world’s most celebrated radical thinkers, and the author of Captive State, Heat, The Age of Consent and Amazon Watershed, follows his own hunger for new environmental experiences, in a riveting tale of possibility and travel with wildlife and wild people. The environment has long been the undisputed territory of the political Left, which has seen the principal threats to the earth as issuing from international capitalism, consumerism and the over-exploitation of natural resources. In Green Philosophy, Scruton argues that conservatism is far better suited to tackle environmental problems than either liberalism or socialism. He shows that rather than entrusting the environment to unwieldy NGOs and international committees, we must assume personal responsibility and foster local sovereignty. In The Greatest Show on Earth Richard Dawkins takes on creationists, including followers of ‘Intelligent Design’ and all those who question the fact of evolution through natural selection. Like a detective arriving on the scene of a crime, he sifts through fascinating layers of scientific facts and disciplines to build a cast-iron case: from the living examples of natural selection in birds and insects; the ‘time clocks’ of trees and radioactive dating that calibrate a timescale for evolution; the fossil record and the traces of our earliest ancestors; to confirmation from molecular biology and genetics. All of this, and much more, bears witness to the truth of evolution. Now recognized as one of the most influential books of the twentieth century, Silent Spring exposed the destruction of wildlife through the widespread use of pesticides. Despite condemnation in the press and heavy-handed attempts by the chemical industry to ban the book, Rachel Carson succeeded in creating a new public awareness of the environment which led to changes in government and inspired the ecological movement. It is thanks to this book, and the help of many environmentalists, that harmful pesticides such as DDT were banned from use in the US and countries around the world. Since they were first published, James Herriot’s memoirs have sold millions of copies and entranced generations of animal lovers. Charming, funny and touching, All Creatures Great and Small is a heart-warming story of determination, love and companionship from one of Britain’s best-loved authors.